Freelance Writer Guide Asks: Is Write.com legit or Is Write.com a scam? UPDATE, AUGUST 2014: Hey dudes and dudettes, just so you’re all aware, Write.com = Crowdsource.com (which in turn “ate” CloudCrowd, a Facebook-based paid online writing platform, last year). If you’re looking for reviews on Crowdsource.com, I got ya covered. This IS a viable place to make money, but do NOT go through Write.com to apply because it’s a bit of a pain and clunky – head over to Crowdsource directly instead for a smoother experience. Write.com is a “platformer” – a writing site that piggybacks an existing site to get work from writers, rather than posting and accepting work through their own site. Cloudcrowd, for instance, is a fellow platformer that uses Facebook, whereas Textbroker is a standalone site that allows workers to log in directly. Write.com uses the Amazon Mechanical Turk site – called Mturk.com – to farm out their tasks. How do I start at Write.com? If you’re interested in working with Write.com, start on their homepage. Click the “Join Our Team” link and you’ll be taken to a 20-question multiple choice test that, as typical writing site exams go, isn’t exactly a piece of cake. It is, however, surprisingly static – meaning that as far as I can tell the questions do not change. You’ll also have to submit a writing sample at the end – mine was on cabinet knobs. How do I get paid with Write.com? Write.com, as we discovered earlier, uses the Mturk system to send out jobs for hire. This means that unlike the vast majority of write-for-pay sites out there, Paypal will do you no good here. Mturk is an Amazon invention, which means you’ll need an Amazon Payments account. Amazon payments are a pain if you’re used to using a Paypal debit card, as the only method for payout (other than using your credit on Amazon.com, natch) is to request a transfer to your bank account, which can take a few days. How is the overall experience at Write.com? For our writing qualifications, we grant writers “intermediate” or “advanced” based on a few areas. We are able to keep track of how long a writer has been completing work for us and the feedback that writer has received from our editors. 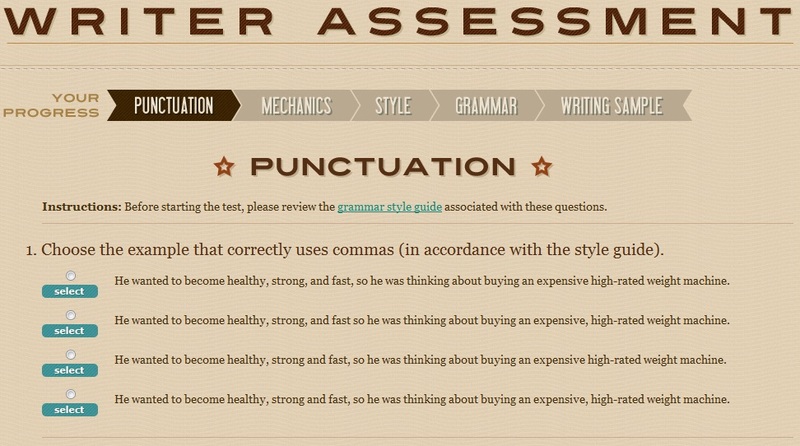 We use this information to determine what qualification each writer should have. So, in other words, if you want to make any real money, be prepared to work like a rented mule for the better part of a year just to gain access to actual writing assignments. Funny, I thought I just tested for punctuation, mechanics, style, grammatical understanding, and writing ability to, yanno, write. It feels like a classic bait-and-switch to me, and I’m more than a little ticked off that a site that purports to be about writing is actually just looking for people to do mindless click tasks for pennies an hour. Freelance Writer Guide Asks: Is CloudCrowd legit or Is CloudCrowd a scam? UPDATE. 6/9/14: Applications and work for BOTH the former Cloudcrowd site and Write.com now go through Crowdsource.com, which in turn will kick you to Mturk (if you have Amazon payments as your preferred payment method) to work on tasks after achieving qualifications, or leave you to work on the site itself (if you select Paypal as your payment option). 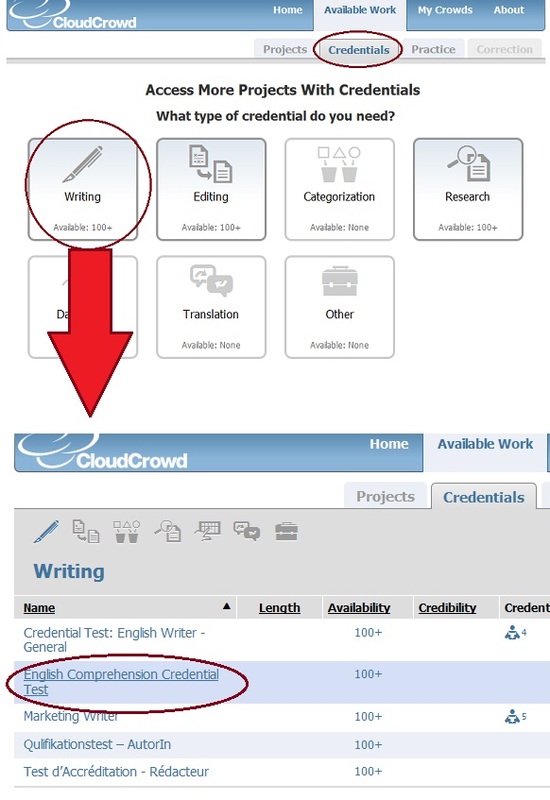 Aside from a tongue twister, CloudCrowd is a combination of a “mill” type writing site with many articles available for writing and a microjobs site, where small individual tasks can be completed for a few cents each. How do I start at CloudCrowd? The test results and credential award for this test should come back immediately, but don’t expect such a fast turnaround for the peer-reviewed writing or editing tests, which take a few days in most cases. 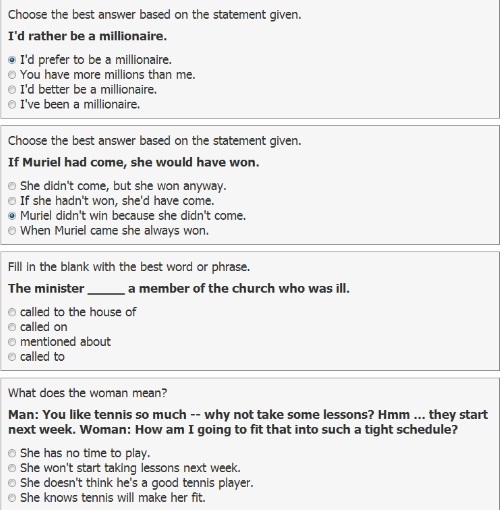 For the writing test, you’re called on to write a 150-200 word piece on a keyword (I’ve seen “green shoes” and “funeral home” on two separate occasions). The marketing test will send you to an Amazon or Overstock product and require you to rewrite the product description. The editing test directs you to a poorly-translated Asian site with the order to essentially rewrite the homepage text – which seems more “rewrite” than “edit” to me, but that’s my opinion. All tests aside from comprehension and all writing tasks completed require you to submit your work as a Word Document – there are no text entry boxes on the site at all. The completed tests will not pay money. How do I get paid with Cloudcrowd? You’ll need a paypal account to get payment from CC, there are no other options available. Payment is made every day – yes, you read that correctly – into your given paypal account. For instance, if you complete $3 of work on Monday and it’s approved by Monday evening, you’ll have $3 in your account by Tuesday evening. This makes CC an excellent platform as far as money desperation is concerned. If something’s about to be shut off and your other writing site paydays fall too far in the future, you can make the extra you need with CC. The payment times vary, but are generally in the 7pm-8pm EST range for yours truly. The site does NOT take a percentage off for themselves, so what you see is what you get – I imagine they’ve done all of their fee-trimming prior to posting the jobs. How is the overall experience at CloudCrowd? It’s a little tough. It’s easy to feel like no one’s listening, and you’re shoulder-to-shoulder with a lot of ESL types, which can make peer review – which the site runs on, by the way – a little bit difficult. Be ready to file appeals for wrongful rejections, but make sure you’re in the right by reading both the site styleguide and the individual task styleguide(s) before beginning – there’s a lot of reading to cover, in some cases. The writing portion often has exhaustive instructions, but they do pay .03/word, which is generous in comparison to a lot of other mills at an average rating level. Lurk the forums for a bit and you’ll see what the common complaints are, which may help you avoid pitfalls of your own. You’ll notice your “credibility” rating once you start at CC – this is an important little number. In general, you’ll get a single point boost for every microjob you complete, such as filling in product spec information for Amazon. (You don’t have to do these microjobs, as writing looks to be a fairly separate animal, but you will need higher credibility for editing tasks). Use the “skip” button judiciously – if you don’t know the answer for sure, just pass it by. Skipping doesn’t affect your credibility and it may save you from hitting a “check task” – a task with a predetermined answer that, if answered incorrectly, will tank your credibility to as low as it goes and lock you out of CC for a full day. Each task keeps you on the screen with a timer ticking down in the lower right corner – if you exit the page or the timer runs out, the task is gone. Don’t get through a 400 word piece and hit the back button by mistake – I did, and I was left with a lengthy piece that had no application anywhere else. 1.) If you’re following the tips I wrote into The Freelance Writer Guide, check to see if there is a Gmail account available with your chosen name FIRST. Don’t decide on a name and find out belatedly that you’ll have to toss in underscores or numbers to make it work. Your email is your first line of communication with private clients – having am exact match between your pen name and identity gives you more legitimacy and recall when it comes time to hand out assignments. An optional but highly recommended measure to take is to swing by GoDaddy domain name registrations while you’re at it and see if a .com is available in the same name – you may want to snag it for your portfolio site later. 2.) For the love of the muse, please don’t pick something that’s hard to spell or overly lengthy. Clients are looking for you because they’re struggling with writing something for themselves – they don’t want to wrestle with odd spelling or grammar to be able to find you. Poll 8-10 friends or fellow writing site forumites if you aren’t sure if your potential handle is a tongue twister. 4.) Be careful. Visibility is a two-way street, and once you start branding yourself it’s impossible to close that particular Pandora’s box. If you’re going to gripe about clients or use foul language in a rant about a writing site, get yourself a different or more generic ID – you don’t want that off-the-cuff remark being the first thing Google presents to your intrepid client, do you? Use friends and family to test-drive your new name choices and see how it goes – popular opinion will typically steer you right. Good luck!